It was a deceptively warm and sunny week as the hype of one of the most powerful Atlantic hurricanes in years, Matthew, approached the Jamaican shores. News reports began to speculate on the anticipated effects, arrival, and potential impact of what was expected to be the worst hurricane since the locally infamous Hurricane Gilbert of September 1988. However, despite the hype, the days leading up to Matthew’s arrival gave real meaning to the phrase ‘calm before the storm’. Admittedly, I took these reports rather lightly as I prepared for a trip to Kingston on Wednesday that we had planned for the remainder of the week and into the weekend. Major public concern began to set in on Friday, despite the clear skies and extreme heat, as we were sent home from work at midday, urged to stock up on food and water for up to 5 days. Based on the advise of colleagues and friends, we began to brace for the worst. Kingston, Sept. 30thJamaica is vulnerable to a number of disasters including flooding, hurricanes, earthquakes, and forest fires. Disaster management efforts in Jamaica are led by the Office of Disaster Preparedness & Emergency Management (ODPEM), which is mandated to “advance disaster preparedness and emergency management measures in Jamaica by facilitating and coordinating the development and implementation of integrated management systems.” The institution has a coordinated structure with committees at the national, parish, and community level involving all sectors of society. The process employed by the ODPEM is a Comprehensive Disaster Management (CDM) Cycle that includes mitigation, preparedness, response, and recovery. While mitigation efforts are a continuous process and despite significantly weak effects witnessed on the Island, I think it is important to commend the preparedness efforts of the local government and first responders towards ensuring the safety and security of everyone on the Island. As the country eagerly watched the hurricane inch closer to its shores, the ODPEM and associated government bodies began to implement measures to mitigate the impact of the disastrous rain (up to 15 inches in some areas) and winds (160 mph at its peak) that would soon make landfall. 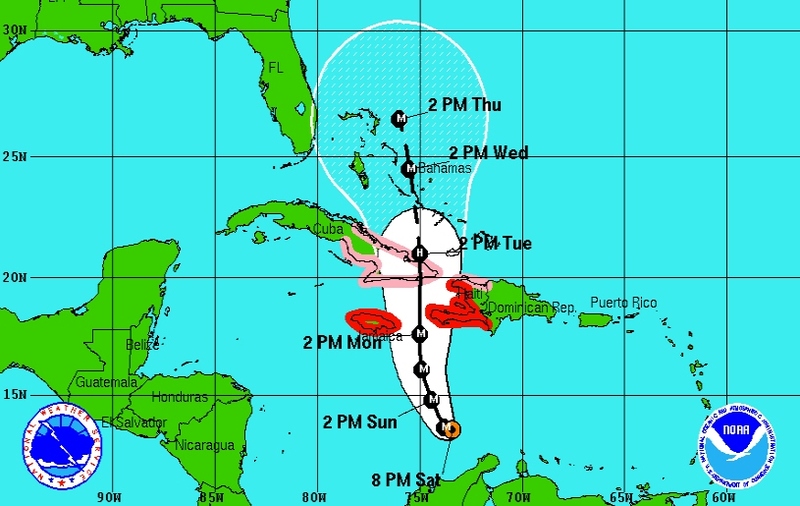 Highly commendable was the efficient process of information dissemination through the Meteorological Service of Jamaica (MET) that issued detailed public advisory bulletins every 3 hours over the weekend preceding expected landfall. These included precautionary actions to be taken by residents, updated meteorological readings of the storm’s strength and location, and anticipated impacts. Other major preparedness efforts included the opening of over 900 shelters across the country, coordinated evacuations of populations residing in flood-prone areas to these shelters, and the clearing of gullies to relieve the flooding. Tape on the windowsBased on this advice, we began to take the necessary precautions. 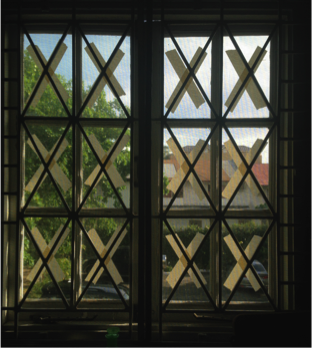 Following an afternoon trip to the unsurprisingly busy supermarket and hunt to find a radio, flashlight and extra batteries, we began to tape the windows – which we were told would reduce the shattering of glass from the expected strong winds. As the hurricane was approaching from the south, Kingston was one of the Parishes expected to get the brunt of the effects. I had am important decision to make – stay in Kingston, bus back home to St. Ann, or fly back home to Canada. An important part of this decision was to consider not only our safety during the hurricane but moreover the conditions and challenges of the aftermath. At this point rumours had began to spread about the loss of power expected to begin on Sunday night and that flooding had led to the closure of major routes across the city, including access to the airport. The consequences of the Hurricane Matthew making landfall quickly became more serious during this time. Although the rumours turned out to be false, based on some consultation, I decided that I would ride out the storm and stay in Kingston, where I would have the greatest access to resources, and proximity to an airport should an evacuation notice be issued. 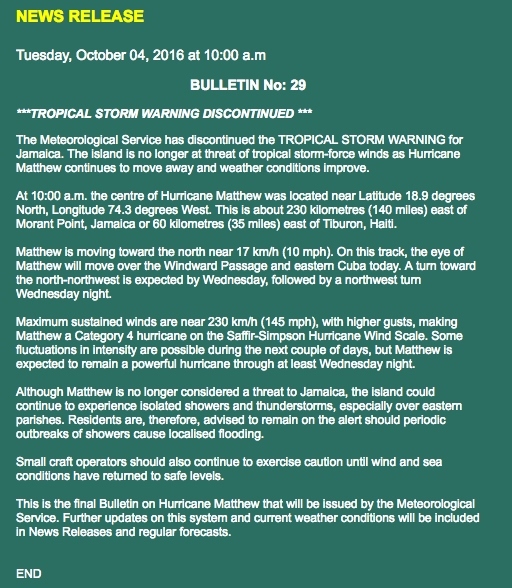 On Monday, October 3rd, 2016, the MET downgraded the warning from Hurricane Matthew to a tropical storm warning as the hurricane’s shift eastward pushed Jamaica outside the range of hurricane force winds. A day later, all warnings were lifted and Jamaica had officially escaped the devastation of Hurricane Matthew. Manal Rajan is working as a Health Administrator intern with Jamaica Family Planning Association/FAMPLAN in St. Ann’s Parish, Jamaica.